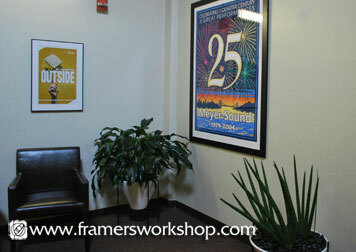 It is always a pleasure to pick up and deliver framing work at Meyer Sound. 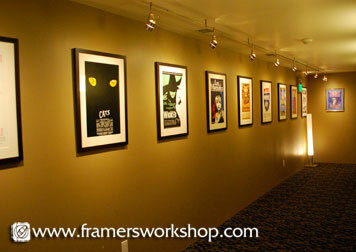 While this worldwide headquarters is always busy, the company culture is welcoming and helpful. As framers and installers we go into environments like this with respect for the need for quiet work and when necessary, will leave an installation while sound-sensitive meetings are taking place and return later to pick up where we left off. Since its founding, Meyer Sound has been devoted to meeting the needs of sound reinforcement professionals with the finest products available, the industry’s most extensive and knowledgeable customer support, and high-level technical education. The 1970s saw sound equipment for live performance increase in power capability, but not in reliability or fidelity. In 1979, John and Helen Meyer established Meyer Sound to create and support high-quality products for sound reinforcement and recording, designed to meet the real challenges faced by audio practitioners. Today, the company’s history shows a track record of more than 30 years of innovation, quality, performance and support. 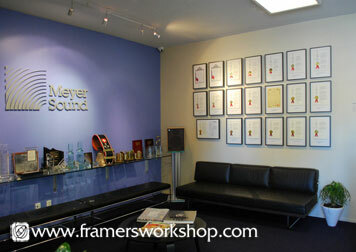 Meyer Sound has more than 200 employees at its Berkeley, Calif., headquarters and satellite offices, including one of the largest engineering staffs (in proportion to company size) in the audio industry. International sales and support are supplied by more than half a dozen offices around the globe. The company works closely with professionals in all areas of sound reinforcement, gathering information on customers’ needs and providing the tools, training, technical support and information to enable the best experience possible for sound system users and audiences alike. Meyer Sound products are manufactured entirely at its Berkeley factory, where high technology is combined with hand craftwork. By performing core processes in house, the company is able to exercise the control to insure its quality standards are met and that each unit is exactly the same as the last. John and Helen Meyer have been personally involved with the performing arts for years, which has given them a feeling for the role of technology in the arts. 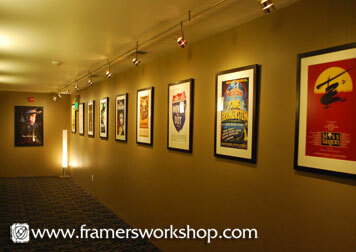 Meyer Sound is often involved directly with the performing arts at both corporate and individual levels, locally in Berkeley and worldwide. This is one more way that the company stays in touch with the real reason for its existence. 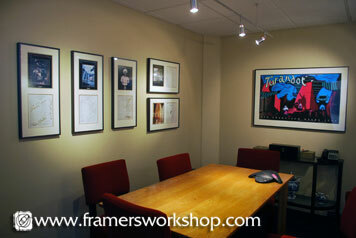 Lobby: We framed these patent booklets using archival techniques. The booklets are held in place with invisible mylar strips with no adhesives. Meyer Sound mineature cello. 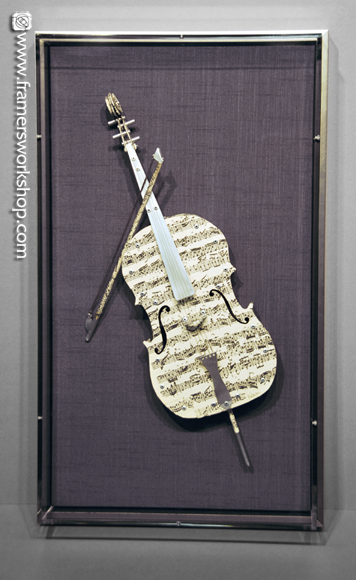 3D Paper Machet art object, attached to silk backing, enclosed in a Plexiglas® case with a silver wood base frame. Attachment is accomplished with a very fine wire so the object is removable. This beautiful two-sided medal was brought to us for framing with instructions to show both sides of the medal along with presentation calligraphy. 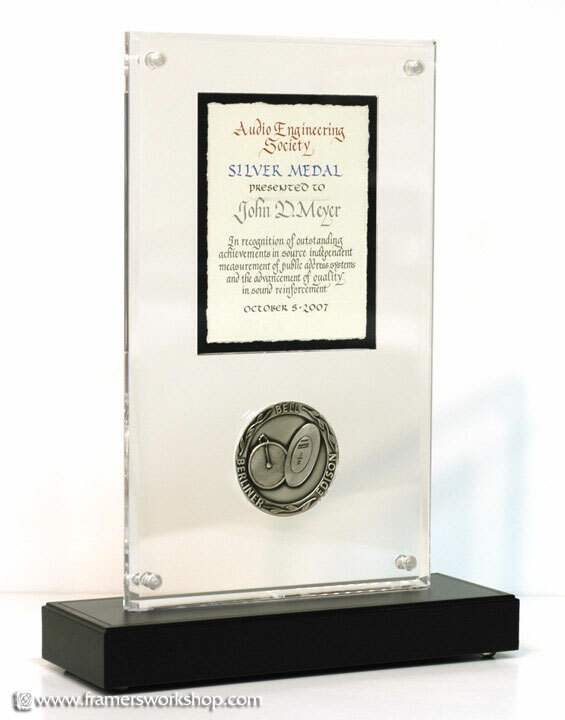 Our solution presents the medal in a two--sided acrylic stand with holes cut for the medal and mounted calligraphy. The one piece of acrylic with cut-outs is covered with two more pieces of beveled ultraviolet protecting acrylic to protect the presentation. The clear acrylic stands in a sleek black acrylic base.